The Maha Kumbh Mela, an eight-week Hindu festival held every 12 years in India and the largest human gathering on the planet, ended three weeks ago. Already, the tent city that had sprung up to accommodate millions of pilgrims is beginning to disappear from the sandy banks of the Ganges and Yamuna rivers, where the faithful had gathered. But back in Cambridge, the real work of understanding the vast temporary city has just begun. Through January and February, nearly 50 Harvard professors, students, doctors, and researchers made a pilgrimage of their own to the festival, which housed roughly 3 million people for its 55-day duration and drew as many as 20 million visitors on peak river-bathing days. Now, those researchers are beginning to analyze the data they collected there, from thousands of patient records at clinics and hospitals to water samples from the Ganges to measurements of the pop-up city’s grid and elevation. 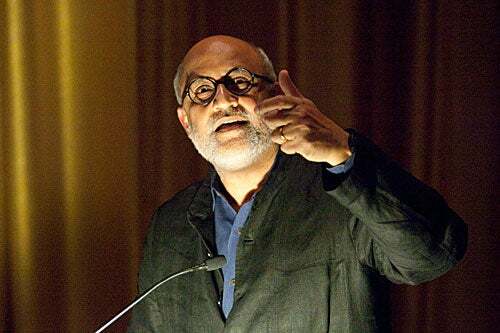 “For the pilgrims, bathing is the climax of the journey,” said Rahul Mehrotra, who has been spearheading the months-long interdisciplinary project since last summer. “For many who participate in the melas, however, these huge human gatherings are opportunities for the practice of commerce, politics, services of many kinds, or public health” — exactly the sort of interactions that bear fruit for academics across Harvard’s Schools. On Monday night, a group of professors and students shared the early results and goals of their efforts in a packed lecture hall at the Harvard Graduate School of Design (GSD). “This is a work in progress,” said Mehrotra, a GSD professor of urban design and planning. That said, there was much to report. Presenters from the GSD, Harvard Divinity School, Harvard School of Public Health, and the François-Xavier Bagnoud Center for Health and Human Rights described their findings — from archival research into melas as far back as the mid-1800s to epidemiological data on disease outbreaks at this year’s festival — all of which the project’s coordinators hope to make available online with the help of the Harvard libraries. Thanks to its connections with one of India’s largest telecommunications companies, Harvard is also amassing from the Kumbh “what we believe is the biggest data set ever of cellphone usage,” said Tarun Khanna, Jorge Paulo Lemann Professor at Harvard Business School and director of the South Asia Institute (SAI), a major sponsor of the project. The trove of information would be a boon for researchers in the growing field of big data, who are tackling the challenges of curating, storing, analyzing, and sharing the massive amounts of information generated by companies and governments in the digital age. “This is a gargantuan data set that we currently don’t even have the technological means to manipulate,” Khanna said, adding that there are still political and legal considerations in India that have not yet been worked out. Google, Cisco, and other companies are interested in the project, he said. In August, SAI will host a two-day seminar on the Kumbh research that it hopes will bring the mela’s administrators to Harvard to explain their work. Video produced by Rebecca Byerly for Harvard Business School. To read the Gazette’s in-depth series on the Kumbh Mela project and to see more coverage of Harvard’s work in Asia, click here. Sakura Christmas, a doctoral student from Harvard’s History Department, is wrapping up work in the archives and libraries of Tokyo and headed for 10 months of study in Inner Mongolia, an autonomous region in northern China that spans much of China’s northern border.